“It’s stunningly cool,” said Ford Kemper, a lawyer and board member of Downtown Roanoke Inc., a tax-supported entity that oversees the city’s historic center. Regarding the proposals… “They’re right on. They’re revolutionary, they’re bright, they’re fresh… They could completely change the face of our downtown,” said Downtown Roanoke Inc. Market Manager Hope Hollingsworth. – Outside balconies on buildings, like in New Orleans, to bring people to the street on more than just the ground level. 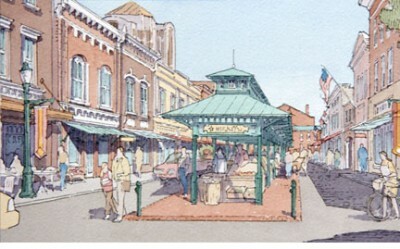 – Moving the farmers market stalls outside to the center of the street rather than inside buildings. – Moving the existing enclosed food court restaurants to face their seating outside. – Adding a movie theater to draw temporary crowds to the street, and downtown housing to draw permanent crowds. You can read the news article here, and see images here.